It isn't the prettiest wrapping job you'll see this time of year. But when the plastic sheeting around the Hedge Hall addition does come off, probably in January, you can expect a fine present indeed: neat courses of brick and granite that masons are laying now. Here we'd been thinking that it would be fun to gut a building. But not for the nail-pulling guy. 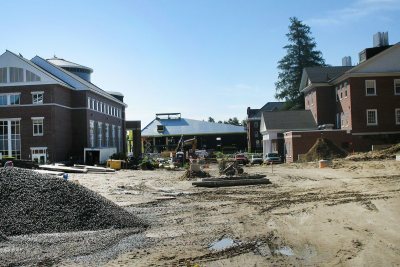 Writing this on Earth Day, Campus Construction Update is pleased to note that the Hedge and Roger Williams renovation project is showing some green. Along with the spring crocuses, spray-painted lines, pastel plastic tape and little yellow flags dotted the soil this week to herald a season of new growth. But these manmade blossoms portend not the awakening of verdant nature but instead Bates' latest major construction project. And the impending renovation of Hedge and Roger Williams halls became much more noticeable March 24 as workers started closing off their work site behind a chain-link fence.